State of Delinquency | News and Features | Style Weekly - Richmond, VA local news, arts, and events. How Virginia stiffs Richmond for millions of dollars and taxpayers get stuck with the bill. State-owned properties like the Capitol get charged a favorable rate — and don’t pay even that. Richmond gets shortchanged every year by residents and businesses that fail to pay their real-estate tax bills. In Richmond's budget for fiscal 2013, the city expects the shortfall to total a little more than $8 million. But one of the biggest deadbeats isn't who you might think. It isn't a slumlord, or a penny-pinching entrepreneur. It's the city's biggest landowner: the commonwealth of Virginia. During the past four years, the state has shorted Richmond to the tune of $3.7 million. In 2012 the state's total unpaid tax bill came to $968,996. And this is after an enormous tax break. "We are being impoverished because of the lack of equity, because of how we partner with the state," City Councilman Marty Jewell says. "Residents end up paying for it with a higher tax rate." It's one of the best-kept secrets at City Hall. The state has been dodging taxes for years. And the city doesn't exactly charge the state full price — or anything close to it. The state pays just $3.1 million of its $4.2 million bill this year, which represents a 88 percent markdown. How? The state government owns $2.9 billion worth of property in the city. This includes the State Capitol, the State Corporation Commission, the ever-expanding Virginia Commonwealth University — the academic and medical campuses have a combined value of $1.5 billion — and dozens of other buildings. Held to the same standard as city residents, the state's bill would come to $34.8 million. If the state paid full price, or $1.20 per $100 in assessed value, it would be enough to reduce the tax rate for every city resident by 17 cents – to $1.03 per $100 in assessed value. That would make Richmond competitive with neighboring counties. Chesterfield residents pay 95 cents per $100; Henricoans pay 87 cents per $100. For a $150,000 house in the city, a 17-cent tax cut would reduce the tax bill by $255 a year. But because the state is tax-exempt, the city isn't allowed to charge the tax rate that residents pay. Making matters worse, the city already has more than its share of churches, nonprofits and other tax-exempt landowners. Combined with all other exemptions, a whopping 23 percent of the city's real estate is off the tax rolls. That represents about $6 billion in assessed value, or $72.5 million in lost revenue. Henrico and Chesterfield counties don't have this problem. Only 9.5 percent of Henrico property, or $3.3 billion, is tax-exempt. Chesterfield's tax-exempt property comes in at $1.9 billion, or 6 percent of the county. What would Chesterfield do if it woke up one morning to find that 23 percent of its property no longer generated taxes? "We'd have to regroup here and see what we could do," says Allan Carmody, director of budget and management for the county. "You could not deliver the services that are being delivered if we had those numbers." There are benefits that come with being the state capital. The state generates lots of jobs, and VCU's massive growth during the last two decades can be credited with sparking much of the city's residential renaissance, especially in the Fan District. No one expects the state to pay real-estate taxes on the full $2.9 billion of property it owns. But the city just needs the minimum payment, which it's allowed to collect under state law. Any jurisdiction where more than 3 percent of its property is owned by the state (in Richmond, it's 11 percent) is allowed to collect a "service charge" on certain properties to help pay for things such as police and fire protection and trash pickup. The service-charge rate is less than half of the tax rate that residents pay, 46 cents per $100 in assessed value. Still, the city asks for only a fraction of that. If it could levy the service fees on all state property, it would generate $13.5 million each year. But it can't. Educational institutions and hospitals, along with public roadways, are exempt from paying the service charges. In Richmond, that excludes almost everything, except for a little more than $4 million in property. 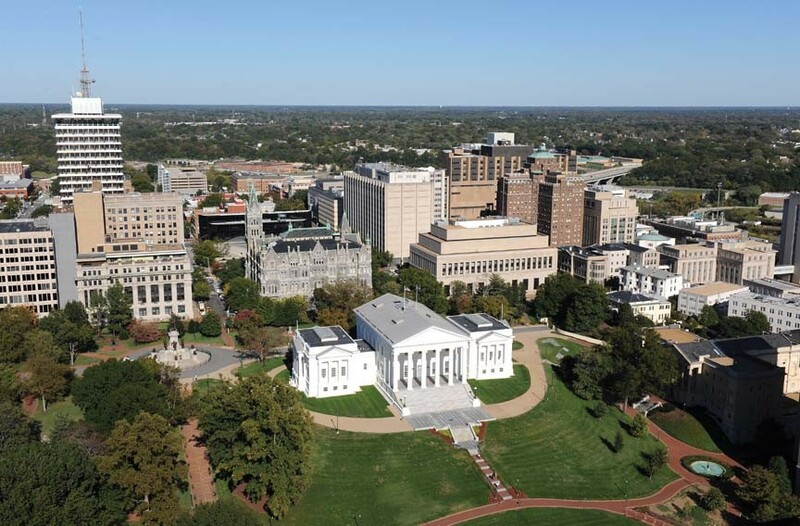 The city is allowed to collect the service fees on Capitol Square and the Virginia Museum of Fine Arts, for example, but the state simply refuses to pay the full amount. Take VMFA, for example. It's assessed at $133 million, and this year's service charge came to $617,510. But the state decided it would pay just a fraction of that — $157,000. Capitol Square, which includes the General Assembly buildings and the Governor's Mansion, is assessed at $146 million, with the service charges coming to $677,491. The state pays only $70,000. "We can bill whatever we want, but they are not going to pay but what's been appropriated by the state budget," says Jim Hester, Richmond's real-estate assessor. That doesn't give the state the right to stiff the city, City Councilman Chris Hilbert says. "If the State Capitol catches fire, God forbid, it's going to be the Richmond Fire Department that's going to put it out," Hilbert says. "The least they could do is try and treat us fairly." Hilbert blames the Dillon rule, which says localities only have powers granted to them by the state. This includes taxing authority. It also means Richmond can't sue the state for lack of payment. "The reality of the situation is, we are a political subdivision of the state. We can go beg and request and ask, but at the end of the day they are going to dictate what they are going to do," City Councilman Bruce Tyler says. "We have no choice." And it isn't like the city has been pressing the issue. In the last five years, it hasn't once come up in City Council's state legislative agenda, which it sends to Richmond's delegation in the General Assembly before each session. Republican Delegate Manoli Loupassi, a former City Council president and Richmond resident, says no one's even asked him about it. "No one has ever called me and said, 'Hey, Manoli, this is something that we are extremely concerned about,'" he says. "I am more than ready and able to help resolve this. It concerns me as a tax-paying resident." Hilbert and Jewell say they too will be seeking some answers. Jewell says the state is sucking up property that could be occupied by tax-paying businesses, producing jobs and other income to the city.